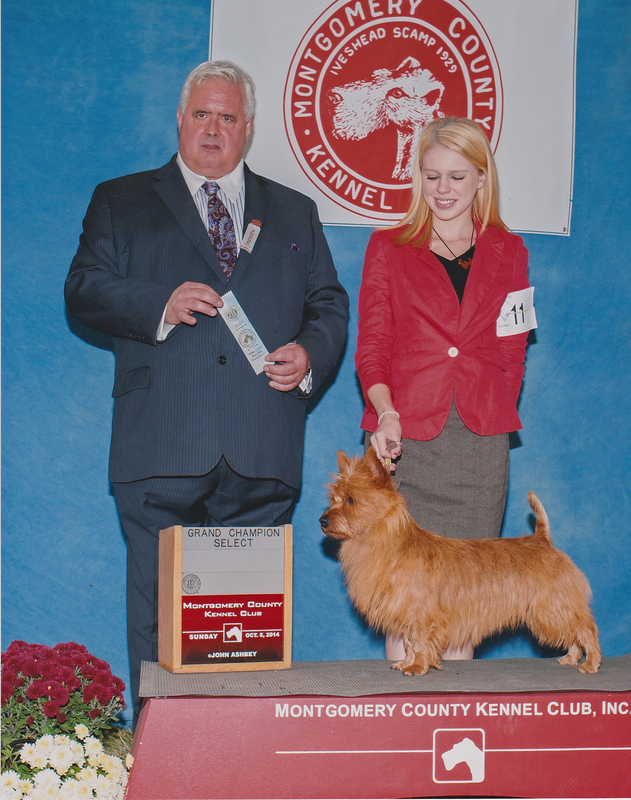 Best in Show November 23, 2014 with GCH Dunham Lake Unanimous Decision "Jake" with breeder/owner/handler Ellie Goiffon. 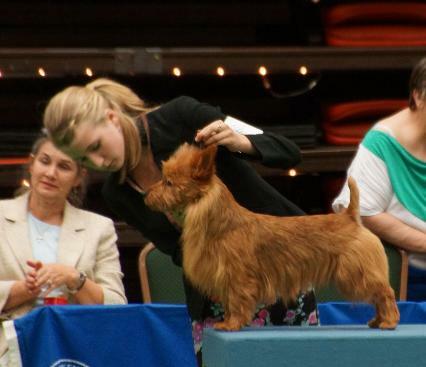 # 2 Australian Terrier in America in both Breed and All-Breed. Thank you to Group Judge Betsy Dale and Best in Show Judge GloriaGeringer for his huge honor. Best Bred By and Select: Ch. Dunham Lake Moon Dream "Miles"
Judge Lowell Davis for this huge honor! First Award of Merit went to BIS GCH Dunham Lake Unanimous Decision "Jake"
Best of Breed: BIS GCH Dunham Lake Unanimous Decision "Jake"
Best of Breed in Florida December 9th: BIS GCH Dunham Lake Unanimous Decision "Jake"
Huge thank you to all the judges for these great honors! Gch. 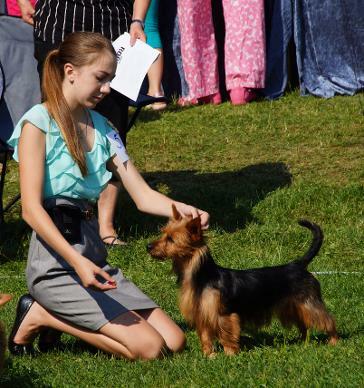 Dunham Lake Touched by an Angel "Gabby" was awarded by Judge David Kirkland Best of Breed at the 2014 Montgomery Terrier Show, we thank him greatly. 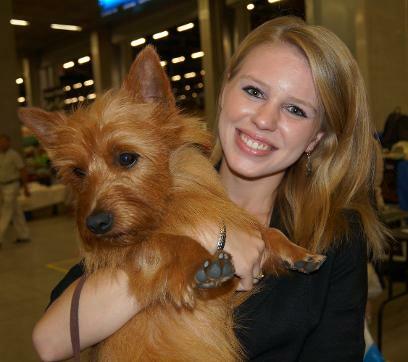 She was shown as always by her breeder/owner/handler Ellie Goiffon. 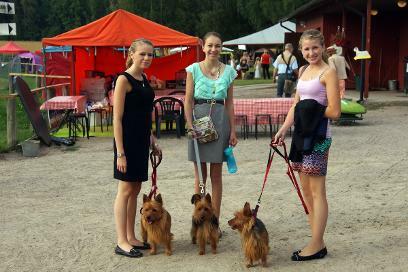 There were 26 Australian Terrier entered. In 2013 her brother MBIS GCH Scoutmaster "Scout" was also awarded this honor, Best of Breed at Montgomery.GCH Dunham Lake Unanimous Decision "Jake" shown by Lydia Goiffon breeder/owner/handler was also awarded Best of Breed two out of the four days and the days he did not win BOB, he received a Select award. 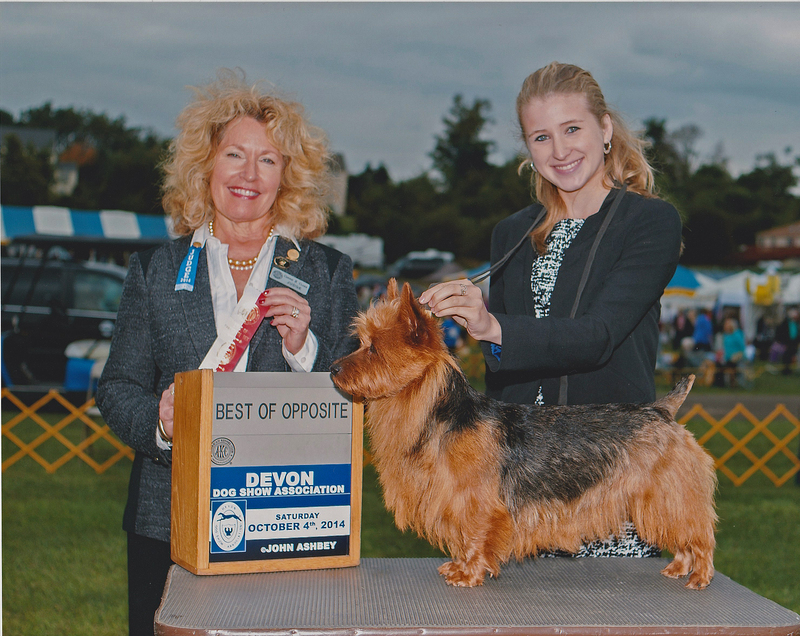 At Devon under Judge Pia Lundberg from Sweden Jake was awarded BOB and Gabby also won Best of Opposite. Having just returned from the world show ourselves, we think Europe has some of the most beautiful Australian Terriers in the world. At Hatboro Jake won Best of Breed under American Judge Connie Clark and Gabby won Best of Opposite. We can't thank these judges enough for these awards and their many positive comments regarding our Aussies and our breeding. We heard several times, our dogs illustrate the Australian Terrier standard. Correct size, medium boned and good movement, to name a few.While we feel truly blessed with these amazing awards, we know there were many other nice Aussies represented at these shows. We had a wonderful time getting to know other Aussie owners and breeders as well as visiting with old friends. 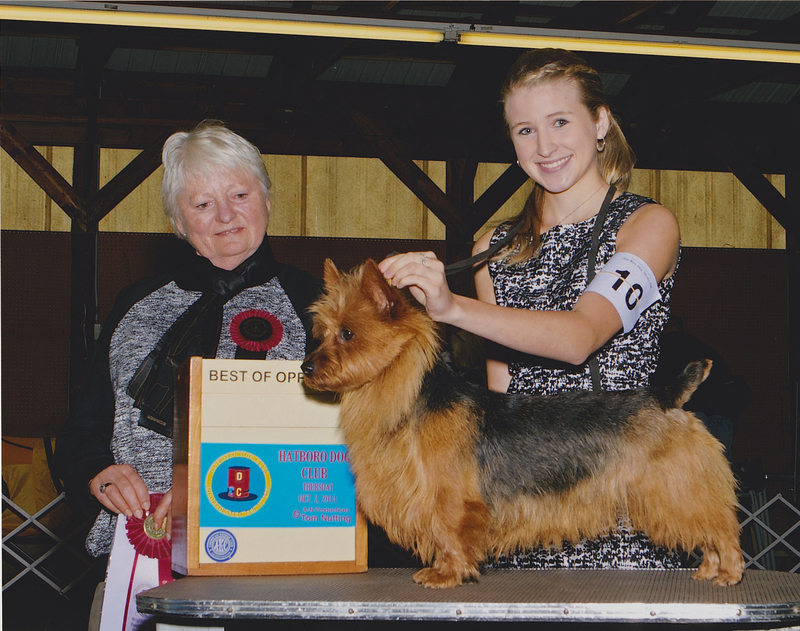 Grand Champion Dunham Lake Unanimous Decision "Jake" Wins an "Excellent" at the 2014 World Dog Show in Helsinki with his breeder/owner/handler and my daughter Lydia Goiffon. 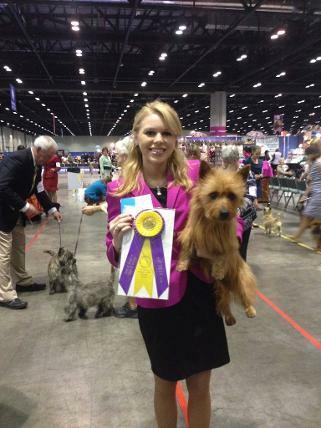 Right is Champion Dunham Lake Goody Two Shoes "Judy" with her owner/handler Samantha. She was awarded "Very Good" at the World Show and the Finish Specialty. She is only 11 months old. Congratulations to Samantha and her family. 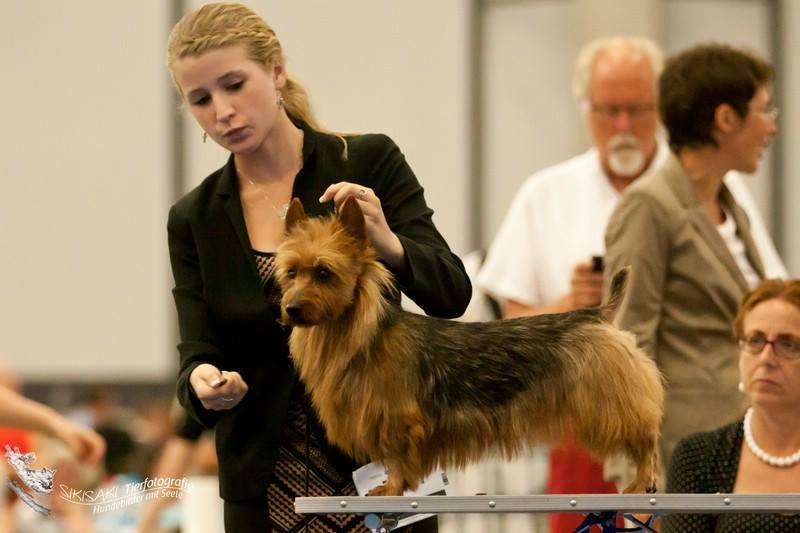 Bronze Grand Champion Dunham Lake Gabriella Touched by an Angel "Gabby" awarded "Very Good" at the 2014 World Dog Show in Helsinki with her breeder/owner/handler and my daughter Ellie Goiffon. So proud of my girls and dogs! 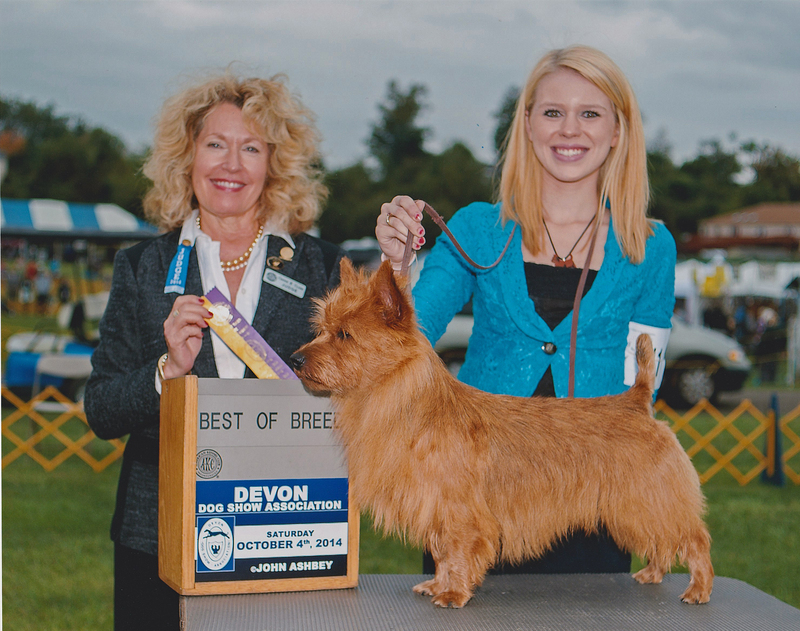 Of the 21,000 dogs entered, we were the only Australian Terriers represented from the USA. Thank to the judges Mr. Elliot Weiss, Ms. Clem McGowan, Mr. Randy Garren, Mr. John Wade Mr. Clay Coady, Mrs. Charlotte Patterson and Mr. Giuliano Biasiolo for these awards. GCH Dunham Lake Unanimous Decision "Jake" with breeder/owner/handler Ellie winning a Group 1 in the Owner/Breeder Series. See more 2014 results below. Select win at the 2014 National Specialty held in Colorado. 2 Group 3 in the Owner/Handler Series GCH Dunham Lake Unanimous Decision "Jake" Ranked #2 Aussie in America in this category. New Bronze Grand Champion GCH Dunham Lake Gabriella Touched by an Angel "Gabby"
New Champion Dunham Lake Moon Dream "Miles" under Mr. Elliott Weiss, Ms. Clem McGowan and Mr. Randy Garren as well as a Select win under Mr. John Wade. GCH Dunham Lake Unanimous Decision "Jake" wins two Group 4 wins June 20 and 21 under Judges Mr. Randy Garren and Mr. John Wade. 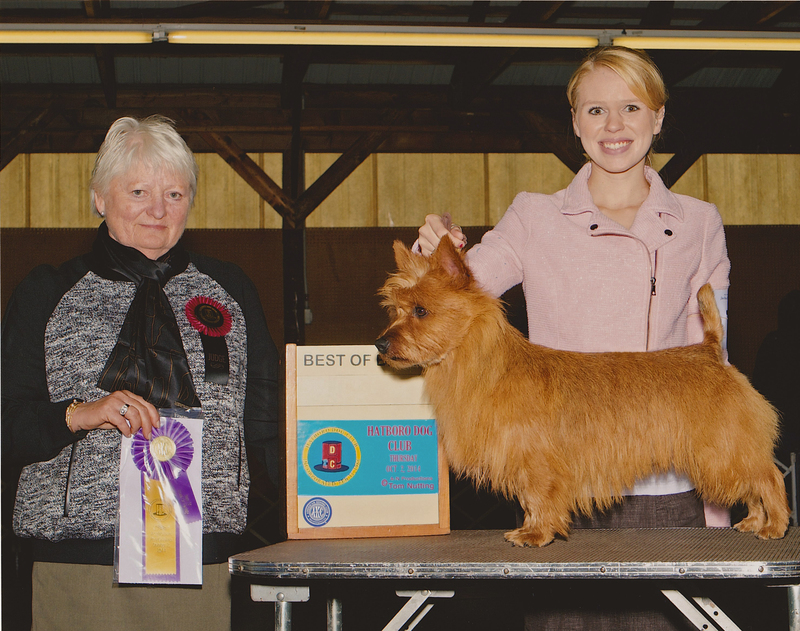 GCH Dunham Lake Touched by an Angel "Gabby" wins two Select wins at the 2014 National Specialty weekend in Colorado 80 Australian Terriers entered. Dunham Lake Arista Magic Cheers to You! 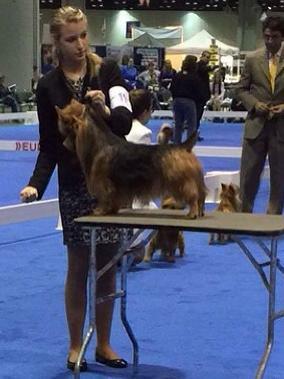 "Karla" wins her class at the 2014 National Specialty. She has a natural tail. GCHDunham Lake Unanimous Decision "Jake" makes the first cut two days at the National Specialty. New Grand Champion Dunham Lake Unanimous Decision"Jake" Wins BOB 4 days and a Group 4 in Kansas April 6th under Judge Elliot Weiss. Dunham Lake Goody Two Shoes "Judy" 2nd show wins a 5 point major and a 3 point major with her owner/handler Samantha. 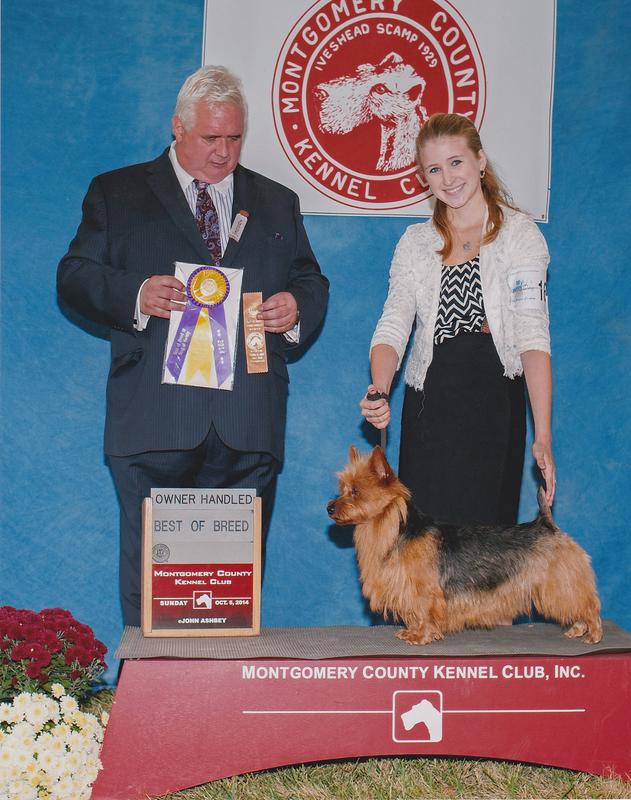 Dunham Lake Celebration "Mara" wins a Major in the Bred By Class with Ellie. Dunham Lake Right on Target "Archer" wins Best of Winners for his 2nd Major. Dunham Lake Let Freedom Ring new to the show ring, "Liberty" wins her first Major! For current Show News check back with us often. For 2013 Results click here.